Hey Sugas!!! In middle and high school I had a best friend and we shared clothes all the time. When we’d go shopping we purposely didn’t buy the same thing because we know that we would just share and swamp them later. Well the indie polish world had allowed me to do just that with a good friend of mine, Nicole but you may know her as @mommyrichietoo on IG. And let’s face it, polish comes in 1 size fits all so you dont have have to worry about if it’s going to fit. In my swap I received several polishes from Nvr Enuff Polish (NEP) including The World Es Mi Familia. This 5 piece collection was inspired by the Disney Pixar film, COCO and originally released 10/13 at The Indie Shop. The collection then released online on 10/20 for $11 each/$50 collection. 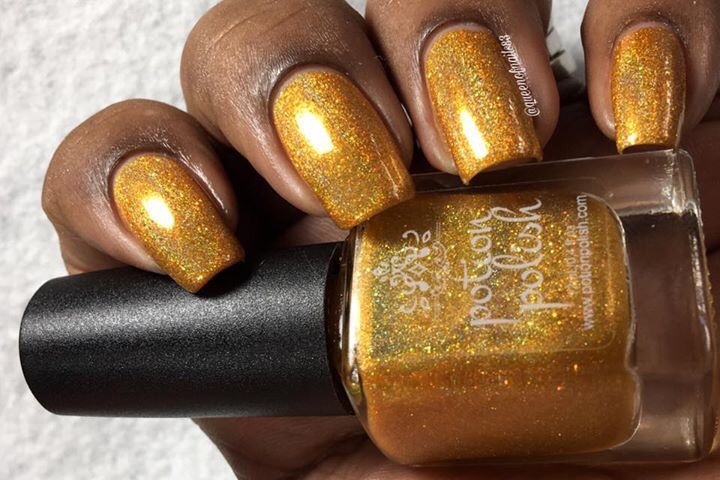 I’m not sure if this collection or any of its polishes will be re-released but it’s is too gorgeous not to share and who knows, maybe you can grab it in a destash or swap 😉. Happy Birthday to yours truly…..ME!!!! Good Morning and happy Thursday and yes today is my birthday. It’s the day I’ll be stuffing my face with a glass of wine, chocolates and my favorite foods. Oh wait, that’s everyday…lol. I’ll do it with my special birthday crown…to make it extra special. My original post for today has been cancelled but I told you I’d be posting everyday this week and by George, I’m a women of my word and I have to keep my commitment. So, I had to dig deep and bring you all something, right? and the only thing I could think of was some swatches and nail art designs from March thru May that I still had on my phone. If you follow me on IG and/or FB, you may have already seen these pictures but if not, then you’re in for a real treat. Buckle in because I have quite a few different looks to show you. Just a heads up, some of these polishes are exclusives or LE and therefore MAY NOT be available. However, others are a core polishes and still available for purchase. If you have any questions, comments or concerns, drop it in the comments section and I’ll be sure to address is ASAP! This past weekend was super busy! Saturday, my family and I welcomed a new addition to the family, our sweet beagle, hound mix, Dallas. He’s 11 weeks of pure cuteness and so far he has fit into our family quite well and we really realized he was what we were missing. But like any mom would tell you, children, 2 or 4 legged, will not/can not stop the show. Luckily, I had the bulk of Mondays post and this one done, I just had to come and add the finishing touches. I can’t lie and say these are my first because they are not. My first was Black Magic but ended up destashing because honestly, I didn’t appreciate the beauty that is Parrot Polish. That was then and this is now. Since then, I’ve joined the fan group and have been introduced the David and Sonja’s infamous desk sales. These sales are quick and painless. David does a quick video of polishes he has on his desk, you pm him on FB messenger with your order, you pay and within a the blink of an eye, you have beautiful Parrots to play with. The 3 I have for you today, literally called my name when I saw them as I happened to be scrolling Facebook one day. Actually, they all did but I was able to show some self control and only get these 3. Cassie is a beautiful, bright, almost neon pink simmer with scattered holo. Blue By You 3 is an amazingly, vibrant, colbalt blue shimmer. I am so excited for this series, already I’ve been able to swatch/use 8 polishes. That’s 8 beauties that once sat unused and untried, that now have either been swatched on 4 fingers or worn as a full mani. Overall, I really love these colors. Parrot Polish is quickly growing on my favorites list and I plan to become a stalker of David’s desk sales and the online store. The formulas and application are easy to work with and the colors and finishes are gorgeous. What Parrots do you own? Hello!! So happy to have you back on this Friday morning. Just another 8 hours and I will be saying ‘HELLO’ to my weekend. I love the weekends because I can actually unwind, not think about work and spend quality time with my family…and polish. 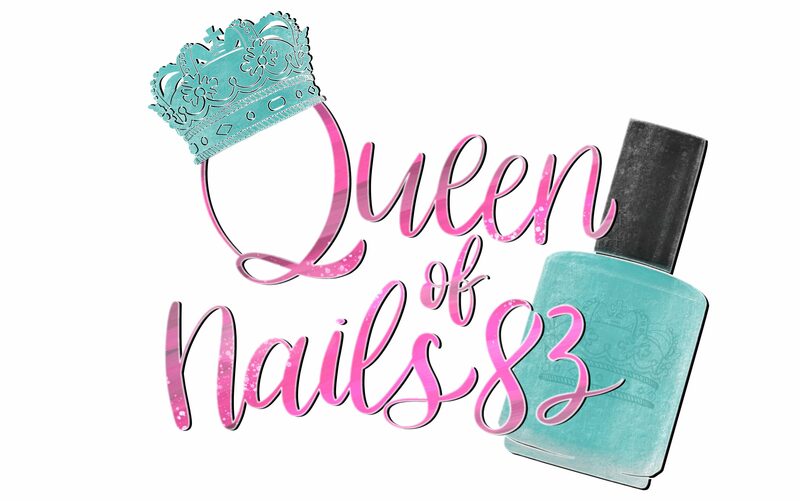 That’s exactly what I plan to this weekend, go through some of my untried polish pretties and at least swatch them. Having some down time in-between PR S&Rs gives me time to really step back and take a look at my collection and go through them. I wanted to showcase and journal, so-to-speak, my journey so I decided to start a new series that I’m calling, Forget Me Not, because I want my polish babies to be reminded that they are not forgotten and I will make time for them….lol. Starting this mini series out, is a brand that before recent, I didn’t own any of. I’m talking none, zero, zilch, nada and I literally went from owning none to now having 6 in my collection. I’m talking about, Different Dimensions (DD)! I’m so excited that I now have a small, but powerful and beautiful starting 6! The first was Stargazer which is part of the upcoming AwesomeSauce box, which you can read about here. The other 5, which I have for you today are part collection, part Polish Con, part LE. So you are in for a treat…if I do say so myself. Whatchu Talkin ‘Bout Willis was the Polish Con LE that a good friend of mine picked up for me. It’s described as a crimson red linear holo with different color flakies. 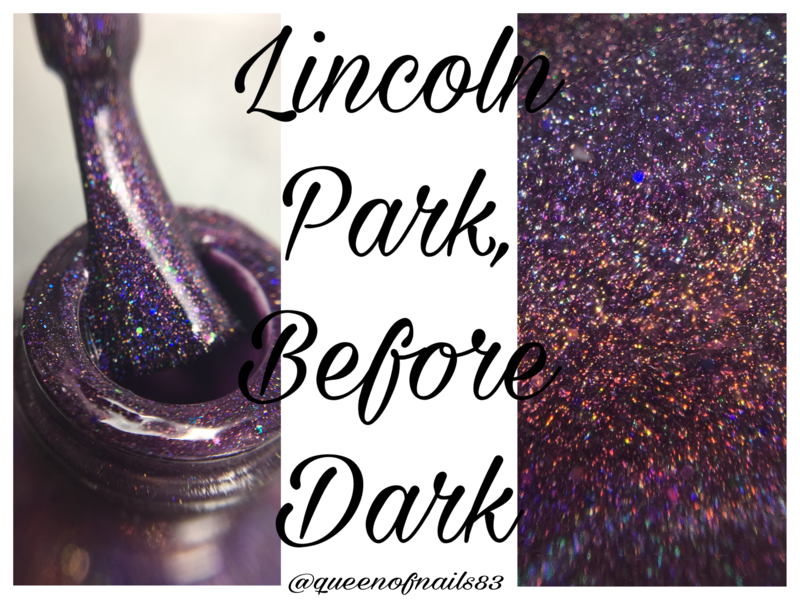 Lincoln Park, Before Dark is a LE still currently available on the DD site. It is described as a dark plum linear holo with color shifting glitters and ucc flakies. And All I Loved, I Loved Alone is an orange jelly with holographic microflakies. This one is 1/4 of the POE Collection, still available on the DD site. 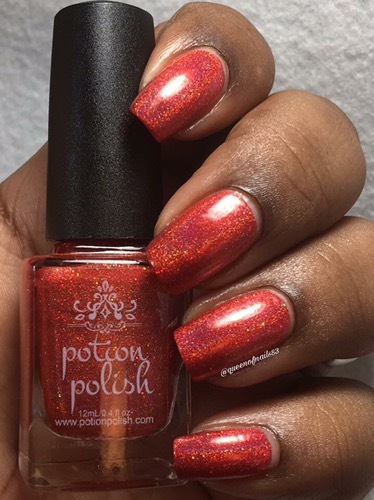 …Dream Within A Dream is a Halloween full coverage glitterbomb, holographic silver base with added orange and black glitters in different shades and sizes. Again, 1/4 of the POE Collection. 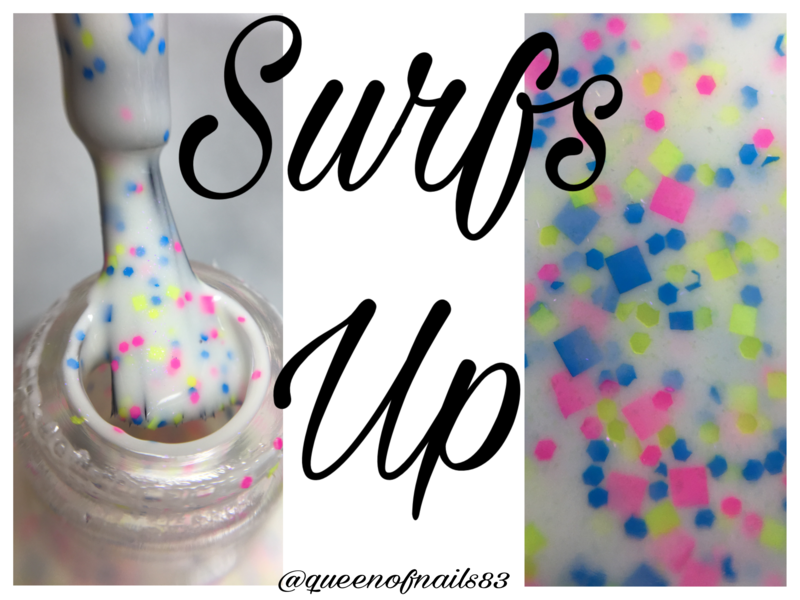 Surfs Up is a is a white crelly polish with added shimmers, with neon pink, neon yellow and neon blue glitters. Overall, I’m ecstatic about these 5 polishes and Stargazer and I am super excited to see what my next DD purchase will include. 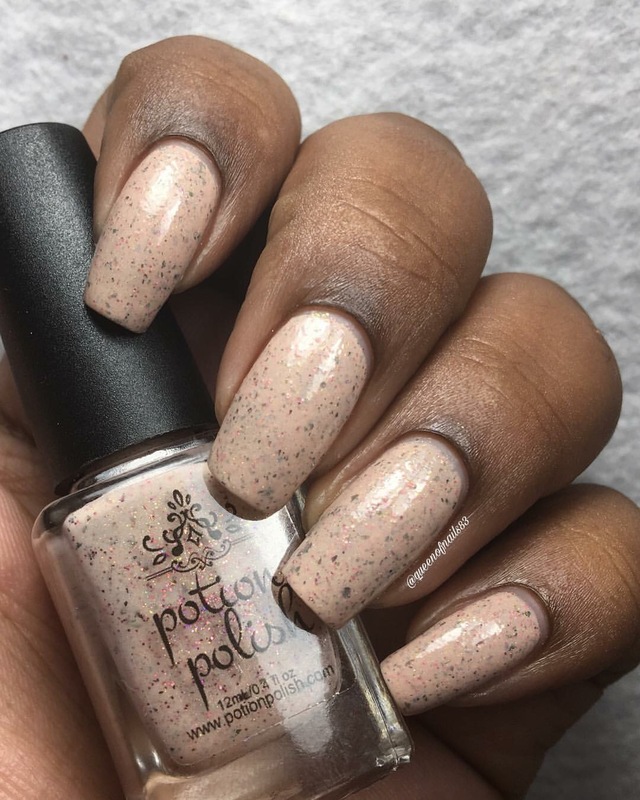 I love the formula, finish, application and coverage with these polishes. I do recommend that you take heed to the suggestion on the DD site, and apply an extra layer topcoat to smooth out glitters. Other than that, no complaints as I plan to be an a vivid customer. For now, do you have any recommendation for a new DD fan? What are some of your favorites?